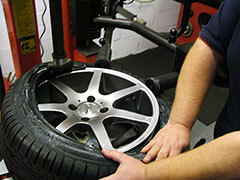 Brierley Hill Tyre Services Ltd is a family business specialising in New and Part Worn Tyres, and associated services such as Wheel Balancing, and Tracking. Along with a host of garage services including Brakes, Exhausts, Oil Changes, Valeting, Refurbished Alloys, Key Coding, Radio Code / Decode, Run Flat Repairs. BTS are based in the Brierley Hill area, near Dudley, and Stourbridge, in the West Midlands and is run by, husband and wife team, Lawson and Helen Thursfield. Lawson is a highly experienced auto fitter with many years of industry experience. Helen has brought her business background to the firm - but is also able to bring a unique female orientated slant to the business. Many clients feel that it is refreshing to deal with a female - especially when they know the business as well as Helen does! Brierley Hill Tyre Services Ltd has always kept the customer in mind and is pleased to assist with enquiries for private, commercial and light commercial vehicles - please visit the contact page for full contact details. All enquiries are FREE OF CHARGE and will be expertly dealt with by Lawson or Helen Thursfield.